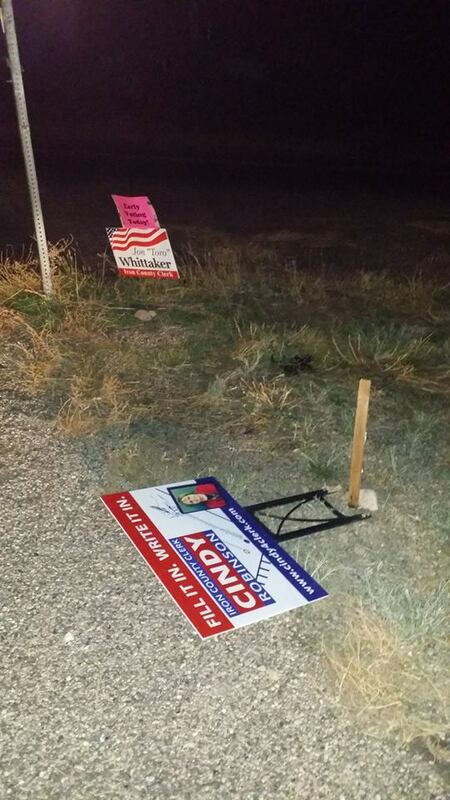 ST. GEORGE — As the Nov. 4 elections draw closer, multiple candidates in Southern Utah are not only having to compete against others in the race, but also against vandals who have been damaging, removing and knocking down their campaign signs. 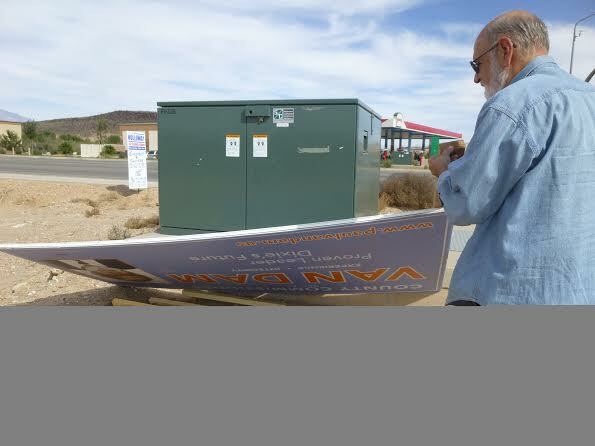 On Saturday, campaign signs for Paul Van Dam, a democrat in the running for Washington County Commission, had been removed and hidden behind a utility box on the corner of 1450 S. River Road, Lisa Rutherford, Van Dam’s campaign manager, said. The Van Dam campaign first heard about the altered signs when they received a phone call from a friend letting them know their signs were no longer there, Rutherford said. When members of the campaign arrived on scene, they found campaign signs for Chris White, a democratic candidate for Washington County Commission, and Shaun McCausland, a Constitution Party candidate for the 2nd Congressional District, had also been removed. 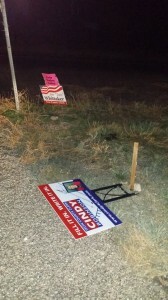 After seeing what had happened to the campaign signs, Rutherford said she contacted the St. George Police Department to let them know about the situation. She said officers let her know they would keep an eye out on the campaign signs in that area. 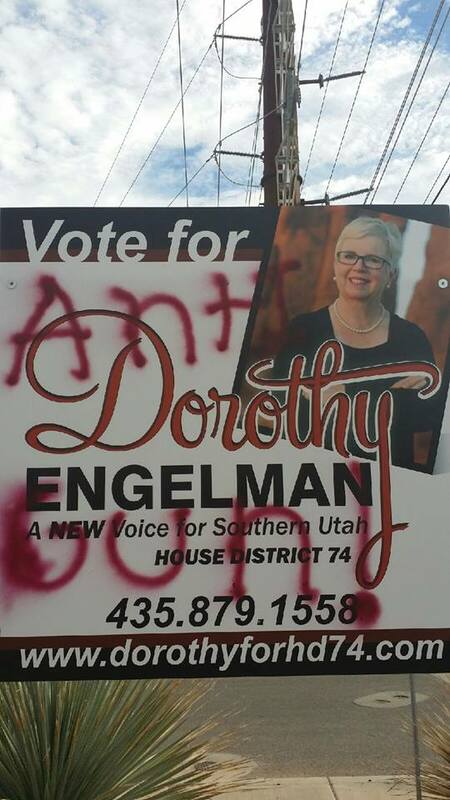 On Oct. 18, a campaign sign promoting Dorothy Engelman, a democratic candidate for House 74, was vandalized with red spray paint. The sign was located at 552 N. Dixie Drive in St. George with “anti-gun” and “no gun” spray painted on both sides. “It was on a sign that cost $200 so I went and called the St. George police Department,” Engelman said. The vandalism occurred during daylight and no other signs in that area were vandalized, Engelman said. Since it was during the day and in a public area, she hopes someone who witnessed what happened will contact the authorities. 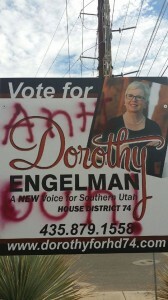 On Tuesday, Dorothy Engelman’s husband, Gary Engelman, said he discovered another campaign sign had been vandalized. A sign located on the corner of Pioneer Parkway and Highway 91 had been run over and had a tire mark going over it. Washington County is not the only area having issues with vandalized campaign signs. Cindy Robinson, a write-in candidate for Iron County Clerk said she has had to deal with the problem multiple times throughout the Cedar City and Enoch City area. The campaign signs have been removed, knocked over and even stepped on and broken, Robinson said. The constant vandalism takes away time that she would normally used to strengthen her campaign. Robinson said friends who have seen someone in the area altering her campaign signs have also contacted her. One told Robinson he confronted a woman about it, but the woman claimed she was just straightening Robinson’s sign. The Cedar City Police Department was contacted about the sign vandalism, Robinson said. Officers told her that they would watch out for anybody altering or destroying campaign signs. There has not been an excessive problem with campaign sign vandalism, St. George Police Sgt. Sam Despain said, but said he urges people to think twice before deciding to alter a campaign sign. “If people steal a campaign sign, it’s theft; and if they destroy them or mark them in any way, it’s criminal mischief,” Despain said. Anyone who witnesses someone vandalizing or removing campaign signs is urged to contact their local law enforcement agency. I’m sure the city has a city code against this sort of thing. Aren’t permits required to display these signs? I don’t care for any of the candidates nor the parties they represent and don’t intend to vote for them. However, I find it pathetic that individuals stoop so low as to do something like this. Here is an idea, if you don’t agree with a certain candidate then get out and VOTE! Let’s act like adults people. Instead of vandalizing these signs, they should have just pulled them all up and hauled them to the dump. Every election time we have to look at all this trash on the side of the road for a month until election day and even a week after that before it’s cleaned up. Instead of outlawing dancing, the city should outlaw campaign signs. The signs really make our roadways look trashy, and they’re downright annoying too. It had to be said. And the majority of the locals continue to show there low tolerance and narrow minded beliefs. Life rolls on here in hill billy heaven. I see the childish vandals are out again. Someone please, start a fund for them for lobotomies. Why do Democrats or Independents campaign for any political position in St George where the masses of kool-aid drinkers only drink the Republican kool-aid? I cannot understand how the kool-aid drinkers feel happy with the oppressive dictators of their totalitarian government. St George does not have a democratic government or society. It is a place of political control, where anyone not submissive to the mandates of the dictatorship may find themselves feeling the brunt of repercussion from government policies, regulations, codes and police enforcement of those policies, regulations and codes. It is strange that those kool-aid drinkers decry the Federal Government for its laws yet allow their own city to trod upon and deny them their Constitutional Freedoms. The kool-aid drinkers appear to enjoy being controlled and uninformed. I’m Ok with it as long as they get rid of those ugly, distracting, rude, handwritten Nihla Judd ones. You know, the ones that are too long to read safely while driving, then end up insulting you. If you are distracted while driving, that’s YOUR fault….it’s not due to a sign on the side of a roadway. They don’t distract ME, but they are a distraction for other people who try to read them, I don’t give a whit about them, except that they are ugly and disgusting and trashy. I have removed signs from my property because they were placed without permission, and i may not to endorse a specific candidate. These signs are out of control. Are the campaigns contacting property ownrs or not? I also see signs on public property and structures, which should also not be allowed. $200.00 for a Engelman sign?!?!?!? She could have saved herself a ton of money by hiring me to do the sign for her…..at least 50%. I have the extra wide tip Sharpies in all the colors available. Then she wouldn’t feel so bad if something happened to her “custom” sign. At least whoever wrote “anti-gun” on her overpriced sign was not lying…..simply telling the truth. One thing about Mrs. Engelman, she is vehemently opposed to guns, yet she fully supports killing infants ( also known as human beings) by abortion. Imagine that! I just don’t understand the mindset of the citizenry of this Great State of Utah who proudly identify themselves as Democrats. Many LDS voters are registered Democrats. I was under the impression that the LDS believe in having as many children as they could in order to promulgate and further their religion. If that is so, how then can they support any Democrat who fully support the killing of infants by abortion?? Wouldn’t that be going against their religion?? So, are they truly LDS?? Judging by some of those photos, particularly the first, my guess is the signs were located on private property without permission. Being in the commercial property management business, we are constantly bombarded with political signs on private properties located on busy intersections. It seems as if the candidates don’t understand the difference between public and private properties. In these cases, many times we will either contact the campaigns and ask to have them removed, or we will take the signs down and pile them up nicely until they decide to come get them. S, sounds like politicians and wanna-be politicians being….well….politicians. Most will tell you, or do, what it takes to get elected. Once again you have the mormon apologists hatefully addressing the politicians, not the destructive ways of themselves or their kids who willfully destroy someone’s property. This article is to address the destructive way of some people, not your hate toward the politician. By making excuses for the destructive ways, you are only furthering the destruction because basically you’re saying as long as it’s certain politicians, the destruction is okay. What a bunch of hateful people you are. Even if it is private property, given the political demographics around here it’s pretty appalling that those who are in almost complete power won’t even let the other team have an opportunity to get their message out. How childish is that? With most property here being owned by Republicans, that generally means that the Dems will have little ability to put out any signs, and the Republicans can continue to roll over everyone. For heaven’s sake Repubs, it’s only a couple of weeks these signs are up. Be a little bit bigger about it! Fascinating. I had dozens of signs destroyed or stolen… Anyway, it is unfortunate, but real. My wife’s grandmother even had her Caplin sign vandalized. When my wife and I saw a Belnap sign fallen down, we would put it back up. Interesting that NONE of the reported damage was done to Republican signs. Pretty much tells you who’s responsible. Another reason I vote AGAINST the “prevailing Utah mentality” and have all of my long life.